Use to connect RTD temperature sensors to the E-SEMS-16U or E-SEMS-2D. E-RTDT-140: -20 to 140°F (-28 to 60°C). E-RTDT-240: 30 to 240°F (-1 to 115°C). Accurate to within ±0.8°F (±0.45°C). Requires the E-S420MA and an RTD sensor probe to operate with the E-SEMS-16U or E-SEMS-2D. Single gang weather resistant enclosure. Use to connect 100 Ohm 385 Platinum RTD temperature sensors to the E-SEMS-2D. Requires the E-S420MA and an RTD sensor probe to operate with the E-SEMS-2D. 0.19" (4.8 mm) round x 0.50" (13 mm) long stainless steel housing. Applications from -67 to 240°F (-55 to 115°C). Accurate to within ±0.27°F (±0.15°C). 100 Ohm Pt 385 curve. 18" (457 mm) 2-wire lead. Requires the E-RTDT-140/240 and E-S420MA to operate with the E-SEMS-16U or E-SEMS-2D. Rugged, waterproof sensor with 9" (229 mm) 304 stainless steel probe with 4" (102 mm) electrical strap and a nylon fitting. Nylon fitting with 1/2" NPT female thread. 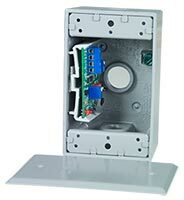 Designed for direct mounting on sheet metal duct systems. 0.17" round, 0.50" long housing. Applications from 35°F to 140°F (2°C to 60°C). Accurate to within ±0.6°F (±0.33°C). Intended for indoor use only, in areas not subject to moisture or condensation. Small enough to be installed in most HVAC thermostat enclosures. 0.18" round, 0.50" long housing. Applications from -30°F to 230°F (-34°C to 110°C). Immune to the effects of moisture and condensation.